This vintage Gurley candle listing has two unusual candles – they’re black cats! Candles measure 2 3/4" tall. They have lost the Gurley cardboard bases/labels and they have some storage evidence. They are very nice candles and are not your everyday finds. The attention to detail on this pin is so typical of Eisenberg Ice productions! 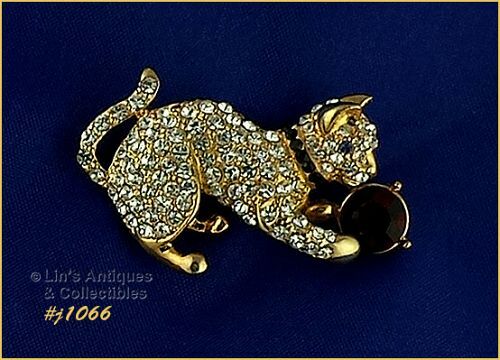 Pin is gold-tone and is a kitten with a ball. This is an unusual and large Eisenberg Ice pin! 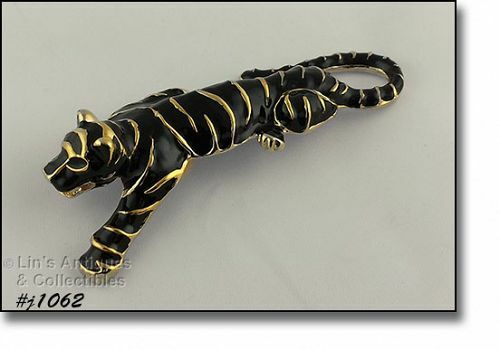 It’s a gold-tone tiger pin with black enameling. Pin measures 4 3/8” long (at longest), 2” wide (at widest), and is marked Eisenberg Ice. I have 2 pins available in this listing. 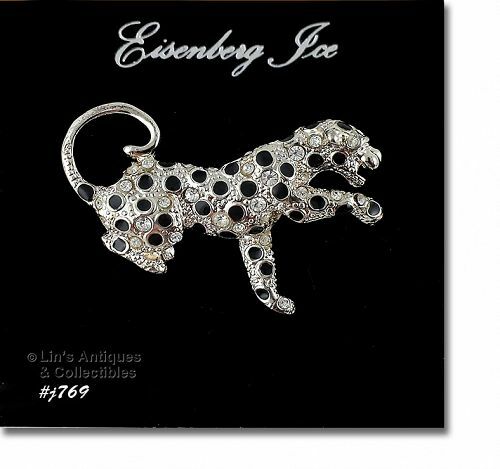 This is an absolutely adorable Eisenberg Ice pin – it’s a baby tiger! Pin measures 2 ¼” x 1 1/8”. It is unmarked but is still on the original store display/hang card. Absolutely beautiful Eisenberg Ice full figure tiger pin! Pin is gold-tone, measures 3 3/8” long (at longest), 1 ½” wide (at widest), and is marked Eisenberg Ice. 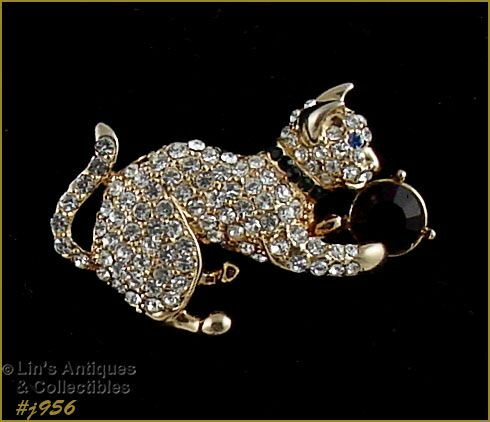 This listing has an Eisenberg Ice Leopard pin! 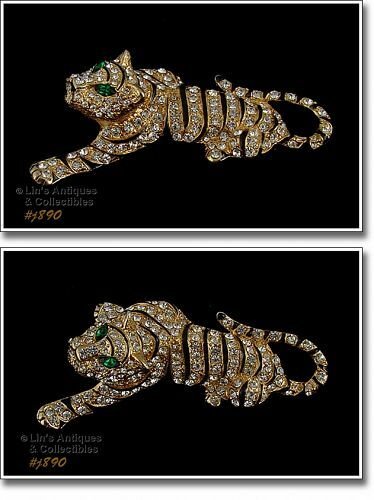 Leopard is silver-tone with clear rhinestones and black enameling. Brooch measures 1 3/4” x 1 1/8" (longest and widest). Pin is unmarked but is still on the original Eisenberg Ice store hang/display card. As with the majority of my Eisenberg Ice listings, pin is new old stock; never worn. Neat and unusual Eisenberg Ice pin! 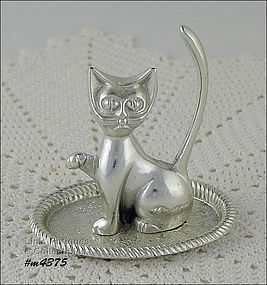 This listing has a cute little cat shaped ring holder! It’s silver-tone metal (reminds me of Godinger items). She sits on, is attached to, a little metal tray that measures 3 ¼” x 2 ½”. The cat is 2 5/8” tall (to ears) and 3 ¼” to tip of her tail. Neat! Aren’t these shakers adorable? Shakers are shaped like kittens/cats and have their own holder. Set is in never used condition and was in the original box when I purchased (box has considerable storage evidence and tears). Neat! 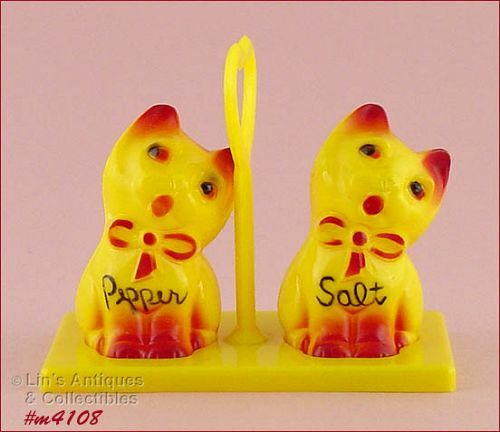 This Lefton shaker set is adorable – it’s “Miss Priss”, the cat! Shakers measure 3” tall and are in excellent condition – even have the original stoppers. These cute spaghetti kitties are a rare find! Spaghetti animals in this color are not plentiful and definitely not spaghetti cats! 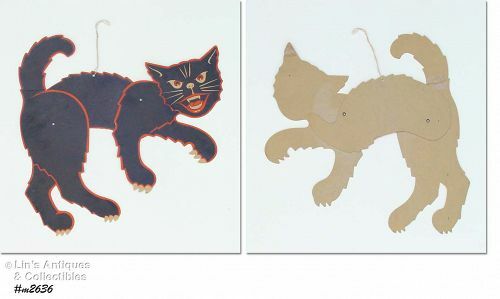 The boy kitty measures 4” tall (at tallest), the girl measures 3 ¼” tall at tallest), and both are stamped on bottom: 52/290 (indicating a limited production). 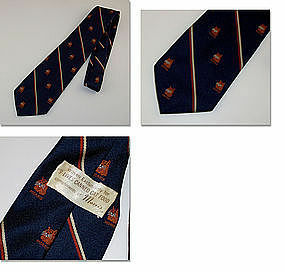 The color, style, and numbers indicate these were produced by Thames. These little black kitty shakers are adorable and are in mint condition! Both measure 2 5/8” tall (at tallest), marked Japan, and have cork stoppers. 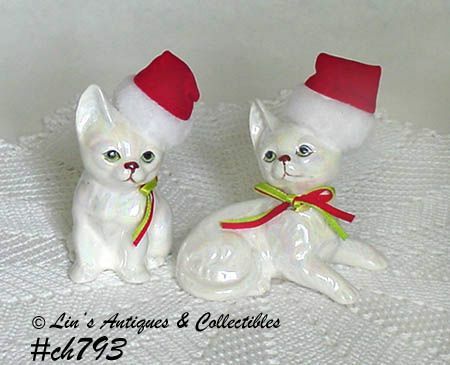 Cute pair of pearlized white Christmas cat figurines in this listing! They each have red and green ribbon bows at their necks and have little Santa hats perched on one ear. Measure 4” tall (at tallest) and bottoms have the Enesco stickers showing a production date of 1988. Excellent condition! Lovely and difficult to find McCoy planter! 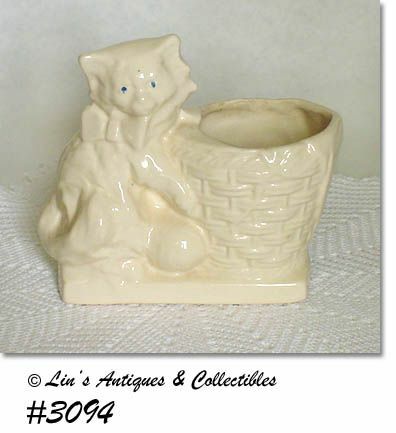 Made in 1942, this is the kitten with basket planter in white with shiny glaze. It has the overlapping NM, USA mark and is in wonderful condition – no chips, no cracks, minor crazing! Planter has been used as intended and has a faint interior stain line. Super item, super addition to a collection!